When it’s time to repair the sewer line at your property, you need a reliable company to perform a professional inspection and recommend the right repair methods. NuFlow St. Louis. has been a trusted name in the greater Irvine area for more than thirty years. Available 24 hours a day, seven days a week and on holidays, if you’re in need of emergency sewer repair, we have you covered. Our dispatchers are on hand to schedule inspections and repairs at your convenience because we understand how inconvenient pipeline problems can be. If you’re looking to repair or replace the sewer pipeline at your home, business, or municipal building, NuFlow St. Louis. offers the most innovative and effective trenchless technology on the market. Even better, we have more than ten years’ worth of experience performing trenchless sewer repairs and pipe lining. Don’t settle for a plumbing company without the experience and expertise needed to properly perform sewer lining. 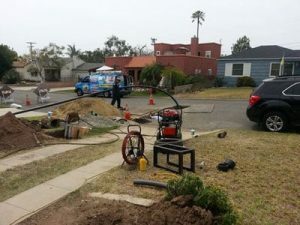 Trenchless sewer repair refers to any method of sewer line repair or replacement that is performed without digging into your property and destroying landscaping and infrastructure. Sewer lining is a form of trenchless repair that involves renewing the pipe internally with an epoxy resin. How Is Sewer Lining Performed In O’Fallon? Initially, one of our NuFlow St. Louis experts will perform a professional inspection on the sewer line with a waterproof, high-definition camera. The footage from the camera allows our technicians to properly diagnose pipe function and locate specific areas of disrepair. Whether the entire pipeline needs to be replaced or one area needs attention, sewer lining is an effective, convenient method of repair. To perform sewer lining, our technicians clean the inside of the pipeline and then insert a felt liner soaked with epoxy resin into the pipe. The liner is inserted through a cleanout, or an existing access point to the sewer line. Using the cleanout enables our NuFlow St. Louis technicians to complete the entire process via trenchless technology. The liner is inflated until it hardens to the inside rim of the existing pipe, creating a new epoxy pipe within in the old pipe. Unlike traditional pipe repair, sewer lining can be completed in a few days or less. Traditional methods take weeks and disrupt your business or home life, leaving a mess and the need for costly property remediation in their wake. Once the project is complete, the epoxy pipes last for approximately fifty years and need little maintenance. They resist corrosion and root invasion, making them the perfect pick for replacing sewer lines. What’s more, the epoxy is environmentally-friendly and non-toxic, so it won’t disrupt the area or release chemicals into the soil. Call NuFlow St. Louis To Repair Your Sewer & Drain Lines Today! When it’s time to replace the sewer pipes at your property, sewer lining is the smart way to avoid extra costs and time-consuming labor. NuFlow St. Louis. technicians have the licensing and credentials to properly perform sewer lining to get your pipes running right again, so call us today to set up an inspection.